Sport Climbers are designed for the sportsman desiring a quick, easy way to ascend or descend trees without the use of a ladder, tree steps, or climbing tree stand. 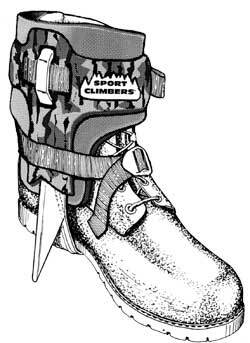 The patented hollow "V" spike and lightweight stainless construction provide deep biting for safe comfortable climbing. The "V" spike is designed to be used in live tree bark only. Sport Climbers are not recommended for pole climbing, dead trees, or for industrial use. For best results and maximum comfort, we recommend use with a 10" high bird shooter, pak boot, or work type boot. It is important to snug the lower ankle strap and upper strap as tight as you can make it. Failure to keep these straps tight could cause uncomfortable ankle pressure, or bending of the leg iron. If bending does occur you can simply bend the leg iron back to conform to the original shape. No loss of strength will occur. To prevent the web strap from loosening during climbing, feed the tail over the buckle and under the rear ladder of buckle as shown in figure above. It is not recommended to walk on rocky ground while wearing climbers, as this can cause damage to the "V" spike. Check spike for sharpness before each climb. You can't afford to get hurt. Practice near the ground until you become proficient in planting the climber spikes into the tree. It is much easier to climb up than it is to climb down, so don't climb too high before you practice. Having two hands and two feet, three of the four of these should be in contact with the tree at all times. Keeping this in mind, place hands to the side or rear of the tree. Use a firm jab with the foot to set the spike into the tree bark. Transfer your weight to the planted foot. Keep your ankles straight and your knees over your feet just like walking up a ladder. Avoid a bow legged posture. This will put unnecessary pressure on the ankles. Take small steps and use your arms to pull yourself up. When coming down take small steps, then lower yourself with your arms. In general, the climbing belt with safety lanyard should be used anytime you are climbing more than 5 feet off the ground. 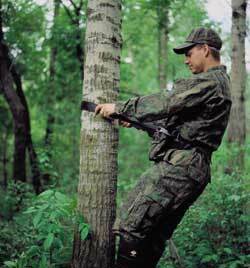 On trees with many branches for hand holds, you may find it better to climb without the safety belt, using the three point climbing method until you reach the desired height. Whenever it is necessary to have both hands free, you should be locked in with the safety belt to minimize the potential of falling any distance. Your climbing belt with safety lanyard is a body belt and web safety lanyard combined into one unit. The webbing is military spec 2500 lb. tensile strength, and all hardware is military spec parachute grade. The body belt is not designed to be a load bearing belt. 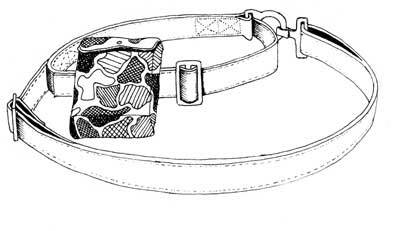 The body belt is designed to position the web lanyard around your waist, and will fit waist sizes of 30" to 50". Smaller or larger sizes should be special ordered. The safety lanyard is adjustable from 4' minimum to 7.5' max length. Adjustment to the lanyard length is accomplished by sliding the slider buckle along the fixed length of lanyard. The safety lanyard is designed to be the load bearing unit by making a continuous loop from the D-ring to the SNAP HOOK around you and the tree. The safety lanyard when in use should always be as short as practical to minimize the potential falling distance. Lanyard forms continuous circle around you and the tree. CAUTION: The body (waist) belt should always be arranged to be inside the continuous circle formed by the lanyard and the snap hook attached to the D-Ring. WARNING: Not a toy. May cause serious or fatal injury. Read instructions carefully before using. Keep out of reach of children. Purchaser assumes all responsibility for maintenance and safe use of this product.